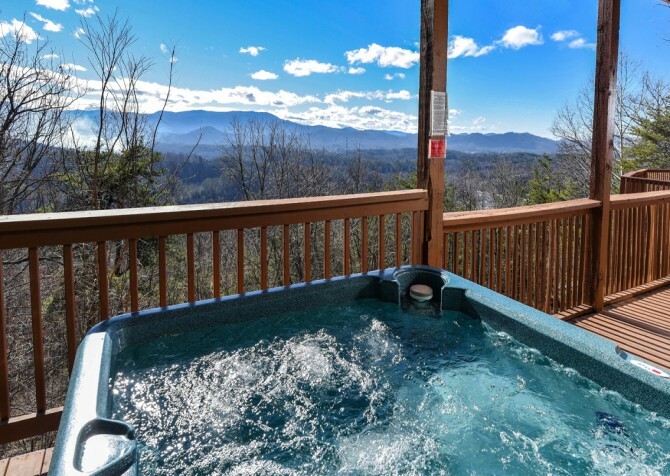 Feel like you’re on top of the world at Smoky View Top Shelf, a 6-bedroom, 5-bathroom cabin with beautiful mountain views and entertaining amenities, perfect for a large family getaway, women’s retreat, or small family reunion. 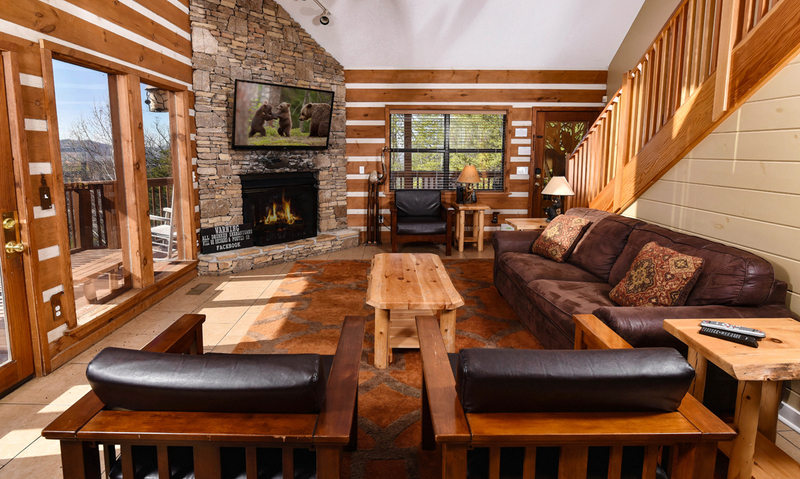 While some chat by a warm fire in the living area, others can relax in the rocking chairs on one of the 4 deck spaces. 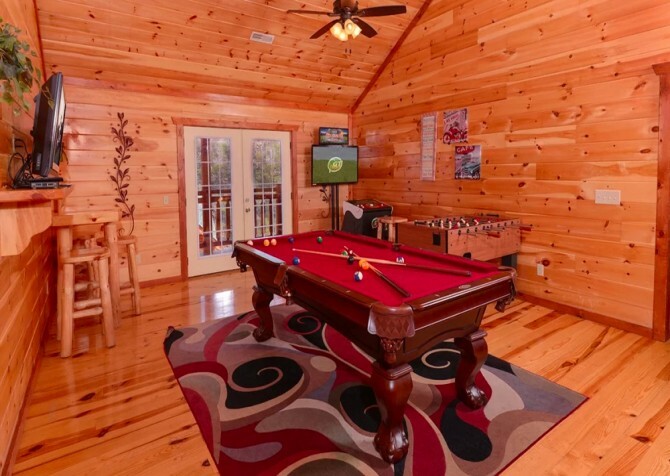 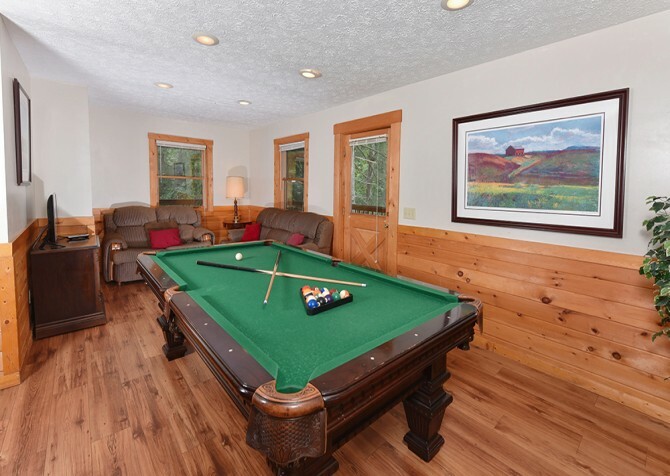 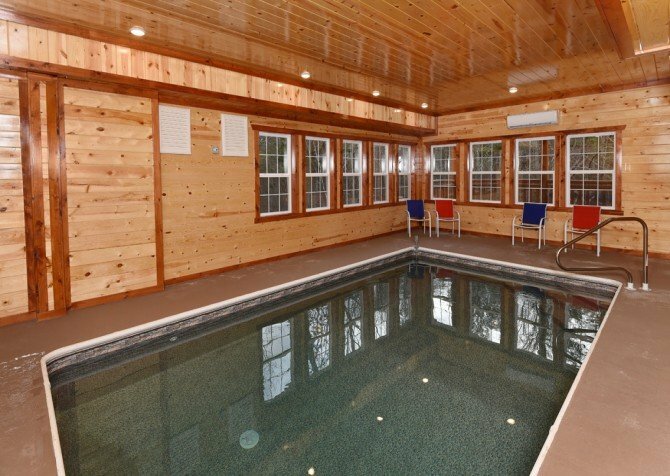 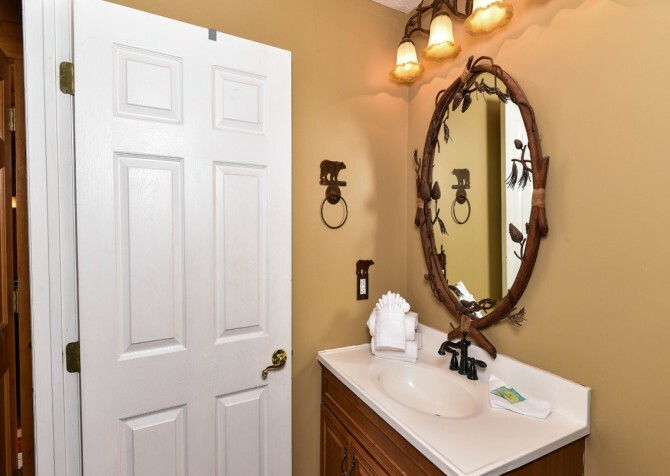 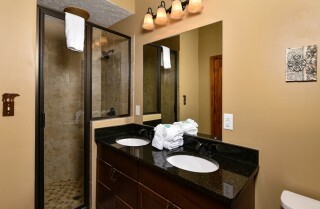 Let the youngsters play for hours on end in the rec room and treat yourself to a hot tub soak nearby. 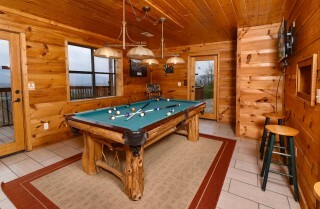 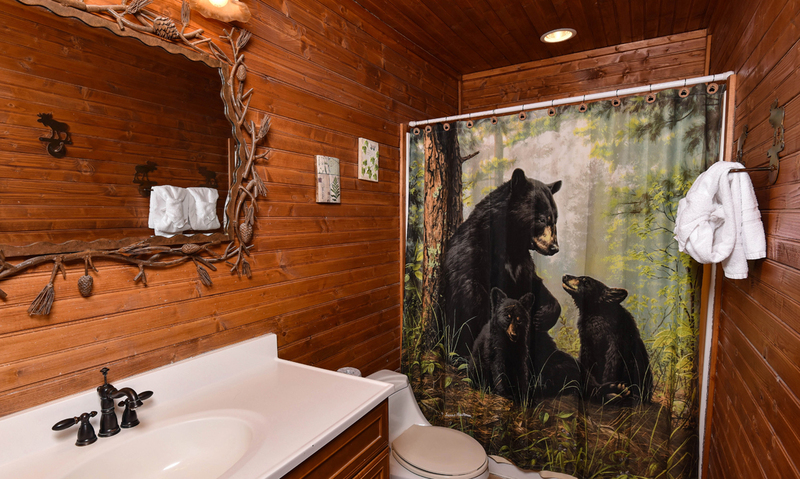 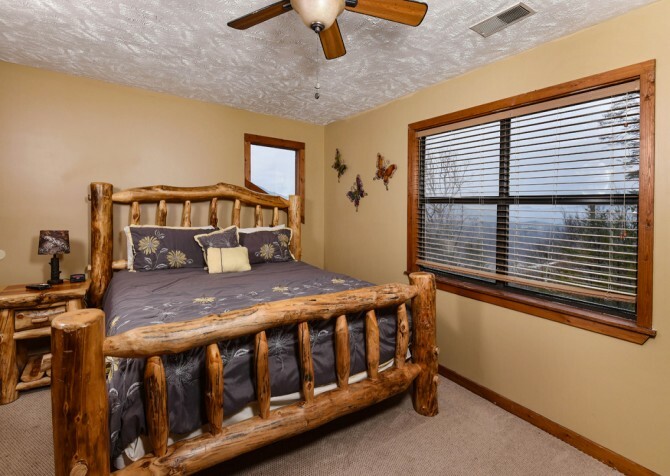 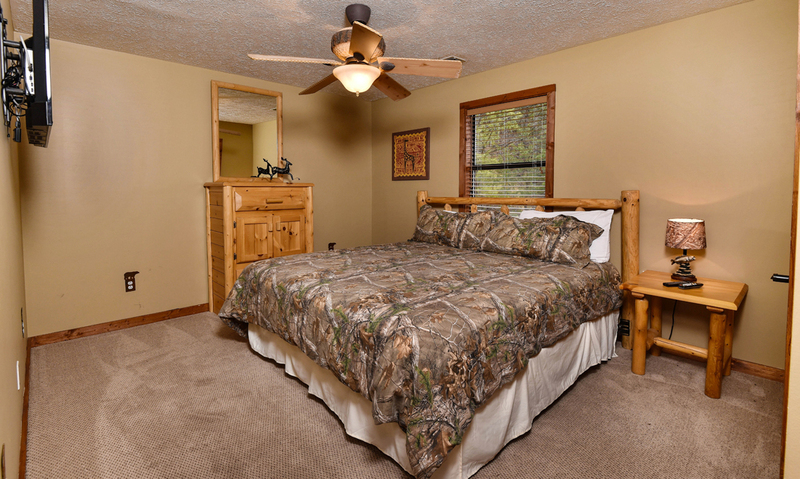 No matter what you decide, this place was made for Smoky Mountain memories! 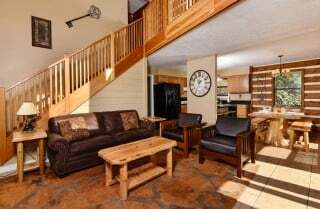 Step into the kitchen just off the living area for morning coffee and buttered toast at the spacious bar area with seating for 3, a cool lunch drink from the fridge and microwaved restaurant leftovers, or a piping hot soup for dinner with freshly baked bread from the oven. 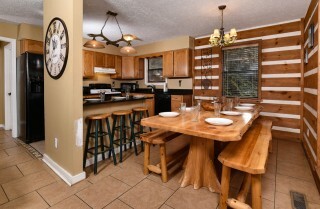 The dining options are endless when you have a fully equipped kitchen on your mountain getaway. Create tasty treats and delectable delights all in the comfort of your own home away from home. 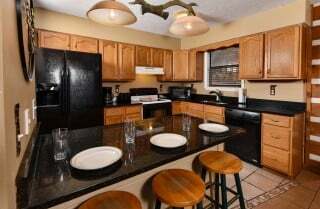 Bake cookies with the kids, host ladies’ night with your grandma’s secret pasta recipe, fix a few sides to go with the evening barbecue, and grab a midnight snack whenever you please! Best of all, a dishwasher eagerly awaits to clean up the mess for you. Plus, with Smoky Mountain views streaming in from the large windows close by, cooking in this kitchen will feel — effortless. Easily set out your meals on the large, wooden table in the dining room — complete with an antler chandelier overhead and lovely mountain views behind. With 2 large matching benches, 8+ people can easily be seated to dine. Gather everyone in the dining space for a board-game battle with a few brought from home or mountain-themed ones from town! 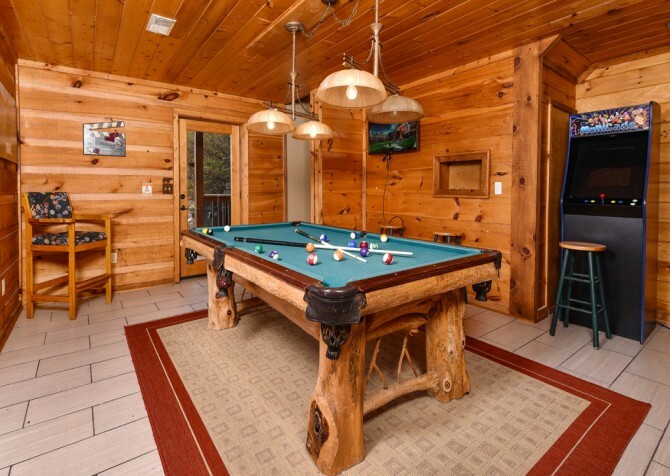 Keep the good times rolling in the rec room downstairs — featuring a pool table with a naturally elegant appearance as if the trees themselves helped craft it. 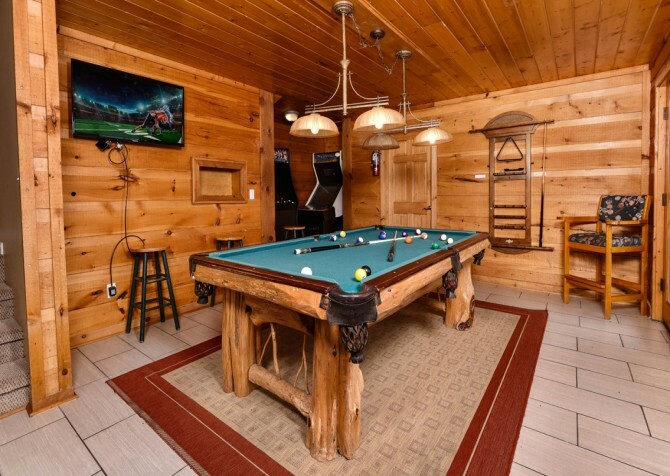 Enjoy a couple rounds of pool after dinner or spend the evening bowling with friends on the Silver Strike Bowling arcade unit. 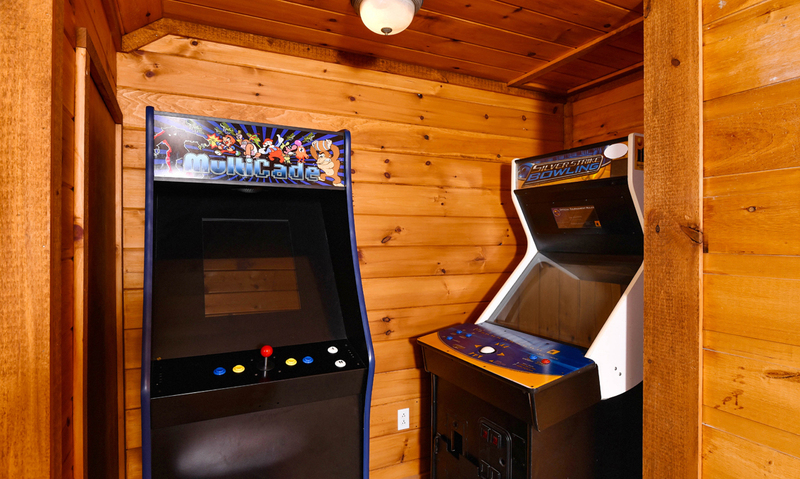 If a classic arcade game, like Donkey Kong, is more your style, tackle the nearby Multicade instead. While waiting for your next turn, have a seat and watch the latest release of your favorite TV show on the mounted flatscreen TV or head outside to the deck for a mountain view or two. 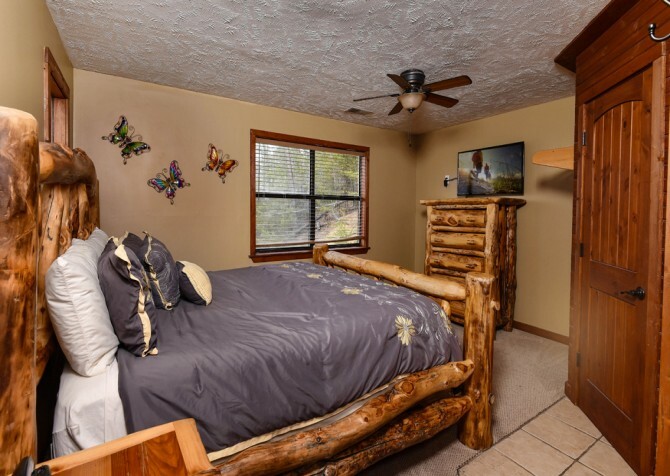 With multiple king-size beds and a TV in every bedroom, everyone will get a good night’s sleep in this delightful abode. 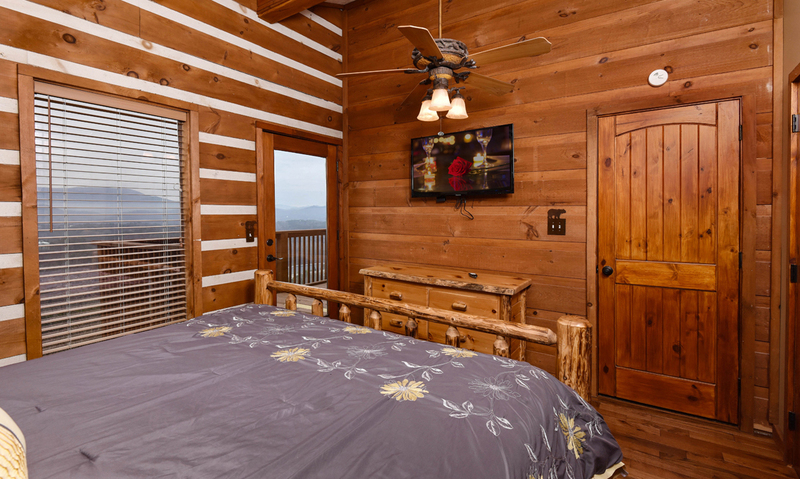 Though, choosing a bedroom may not be easy as this cabin boasts 6 — each with their own unique feel! 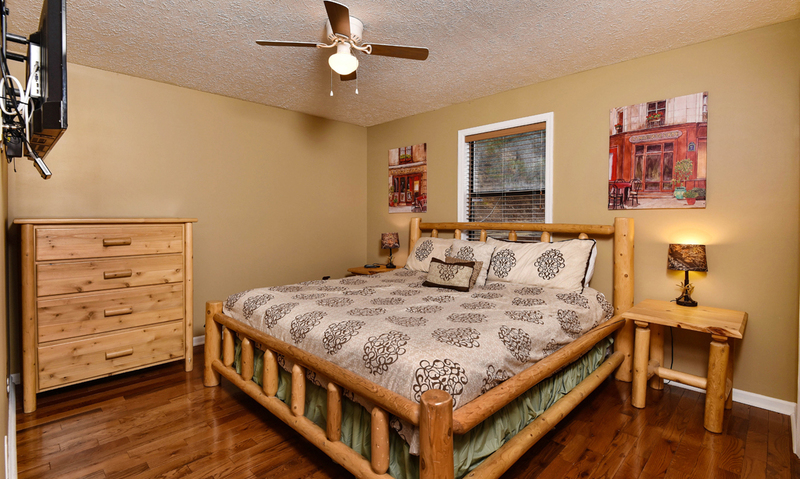 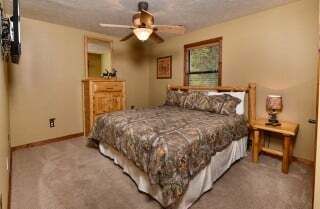 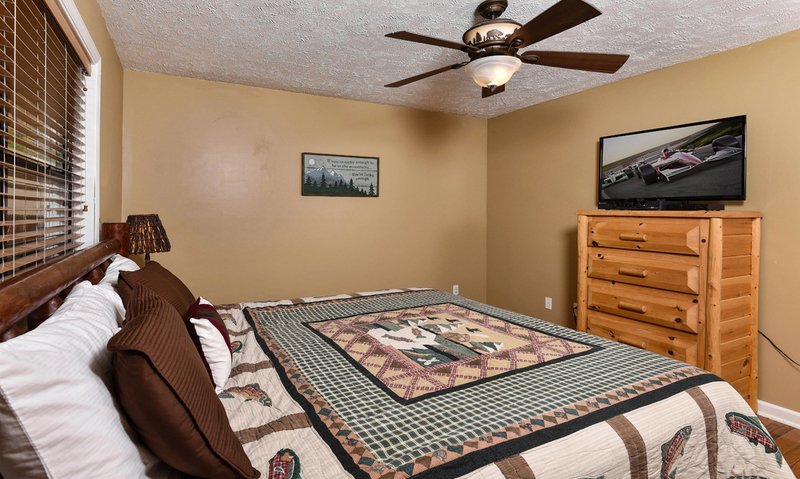 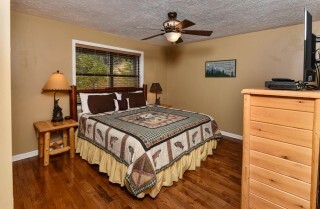 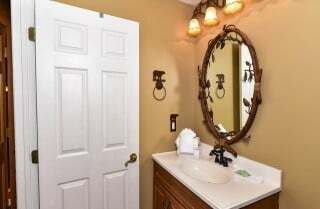 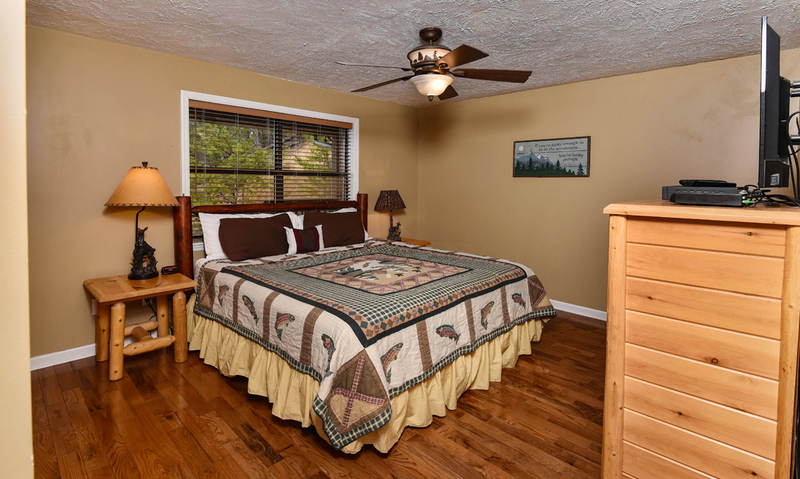 Although there are a few differences between them, each bedroom comes with a standard flatscreen TV to catch up on all the Hallmark dramas and a ceiling fan to keep cool in the warmer months. 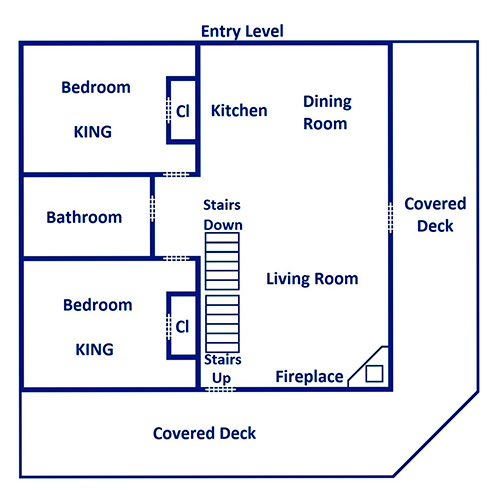 On the entry level, there are 2 bedrooms with a comfy king-size bed in each and a shared bathroom 2 steps away in the hall. 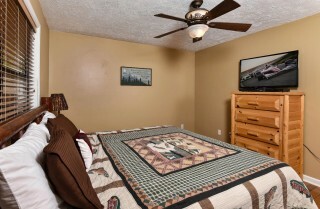 One even comes with a DVD player, so don’t forget to bring your favorite films for movie nights in bed! 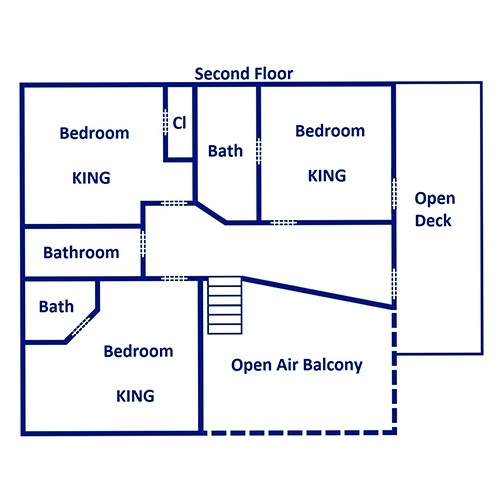 Head upstairs to the second floor, where you’ll find 2 bedrooms, each featuring a king-size bed and one with an open en-suite bathroom. 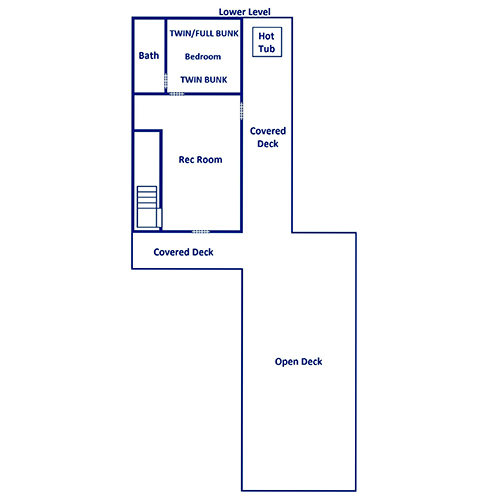 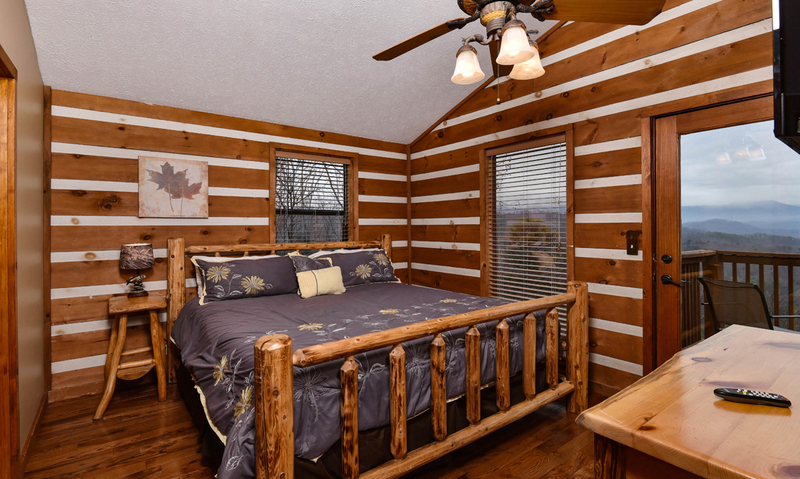 The master suite, which features a king-size bed, direct access to the top deck, and a private en-suite bathroom with a double-sink vanity and walk-in shower, is also on this level — giving you comfort and convenience all in one! 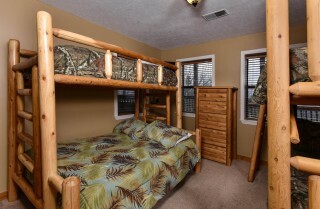 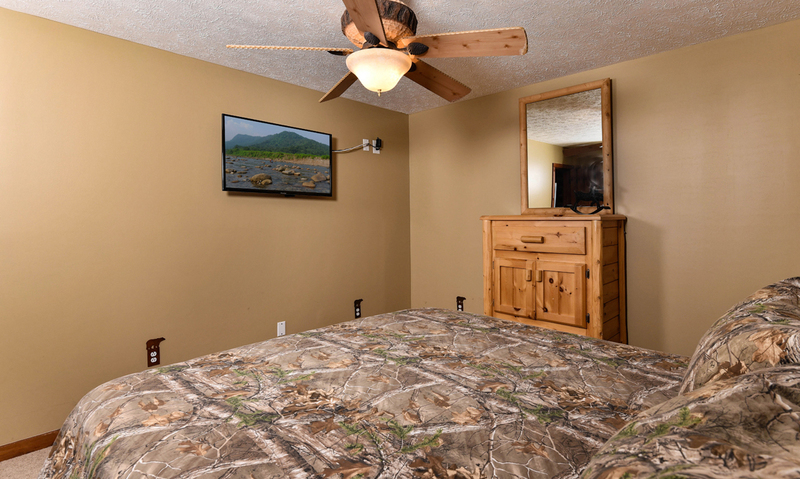 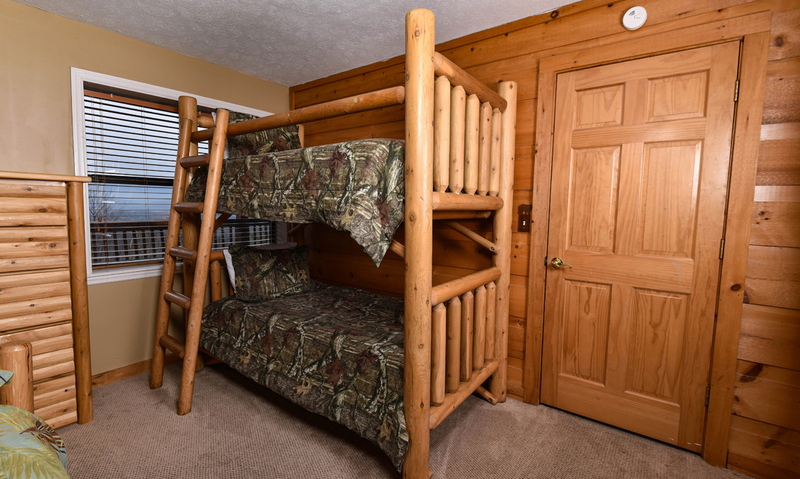 Lastly, the gamers of the family will appreciate the bedroom on the lower level as it lies within arm’s reach of the rec room with 2 bunk beds (1 twin and 1 twin over full), bestowing each roommate with a unique view of the Smokies from the 2 nearby windows. 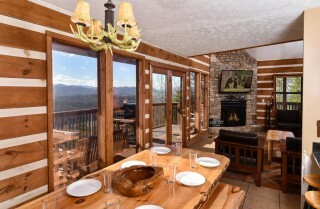 With mountain views galore, the best part about this cabin is the fun outdoor space. Boasting 4 decks with relaxing rocking chairs and first-rate views a plenty, Smoky View Top Shelf was certainly dubbed right! 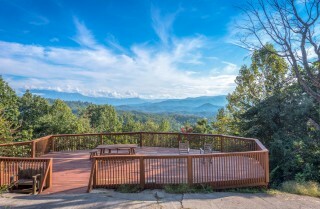 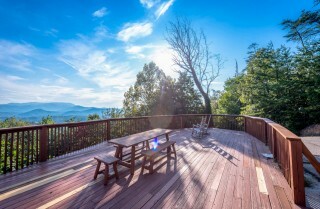 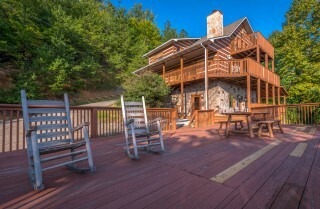 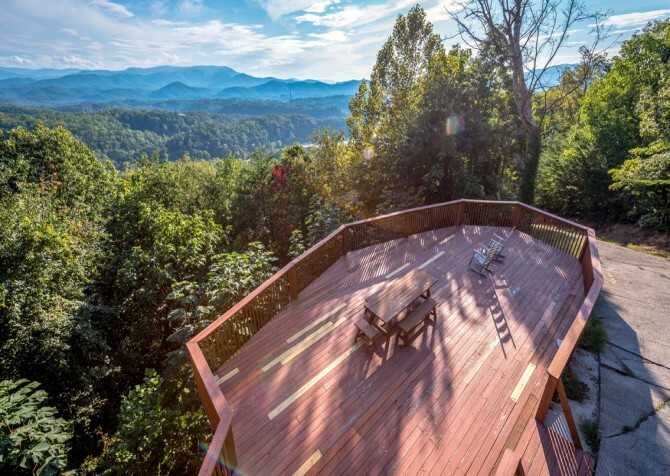 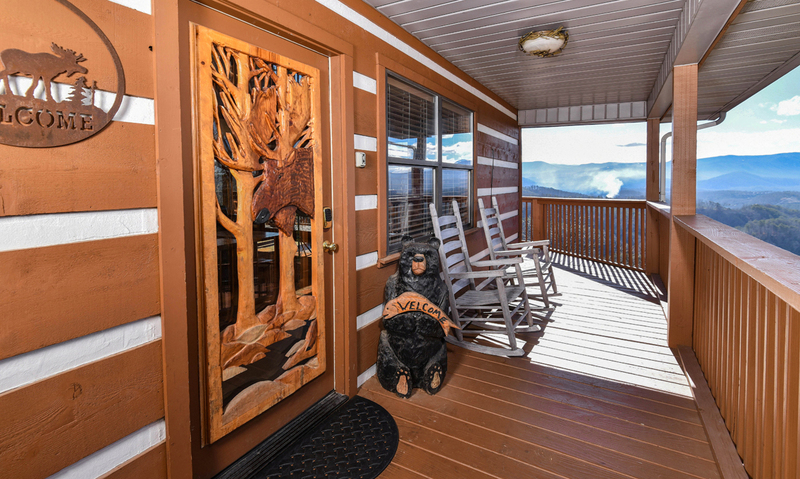 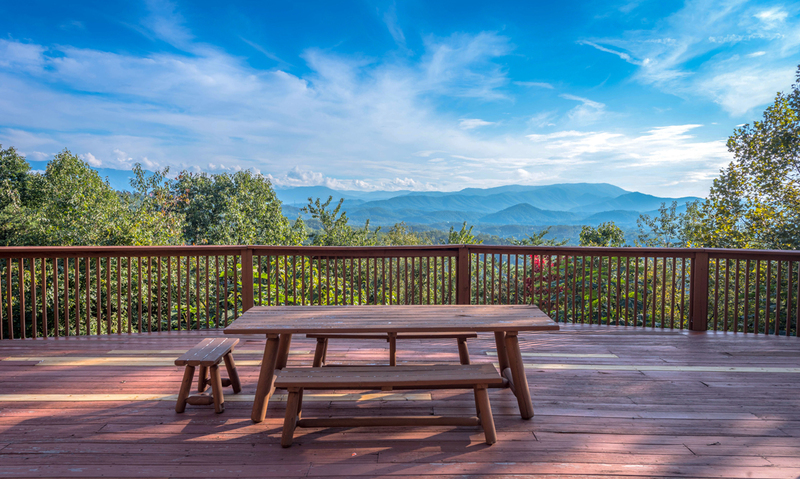 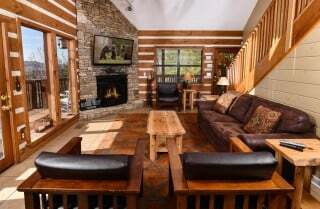 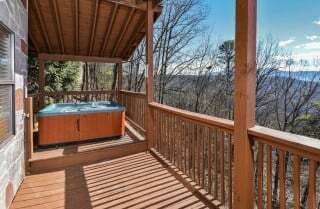 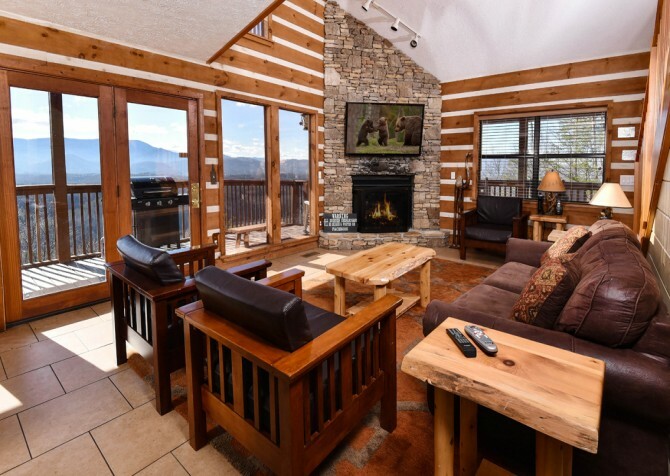 As you arrive up the steep, paved driveway to the home(4-wheel drive recommended), leave your suitcases in the car and take a moment to view the Smokies from the large, open deck — group pictures are a must! 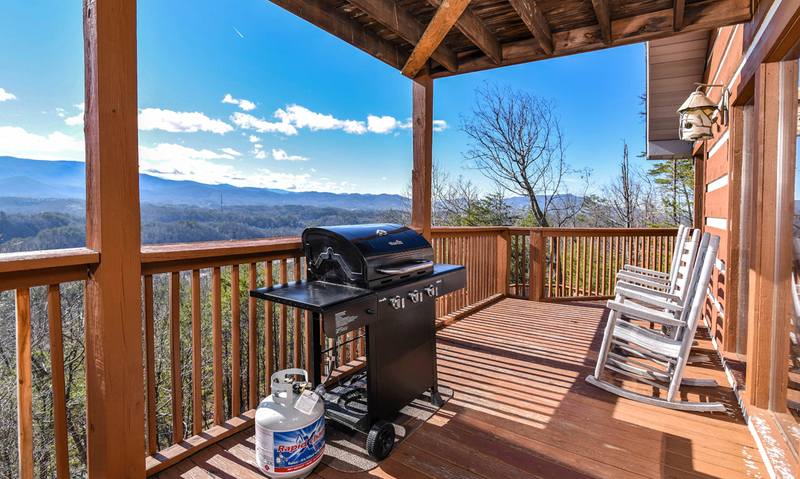 Cook up tasty shish kabobs on the entry-level deck’s gas grill and serve them on the large deck’s picnic table for all to enjoy. 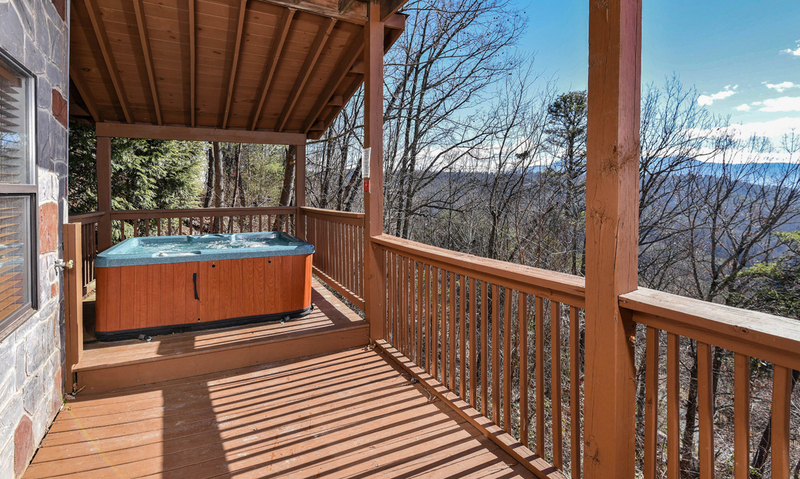 After the party, head for a nice soak in the hot tub on the lower-level deck. When sunset strikes, head to the second-floor deck for a view to remember as the playful evening hues stroll along the majestic mountaintops. 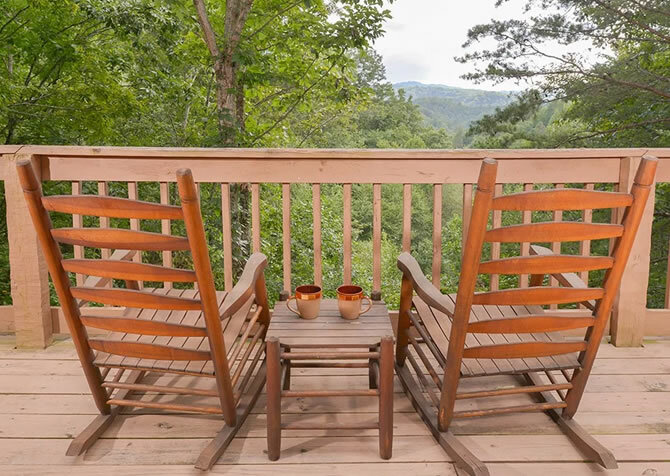 In the morning, hear the melodious tunes of the local wildlife and watch the clouds roll across the valley below from the porch swing on the entry-level deck — with a cup of coffee in hand, what could be better? Leave a little room in your suitcases by taking advantage of the provided washer and dryer. After a morning hike in the Great Smoky Mountains National Park, a good washing will do your clothes some good — trust us. 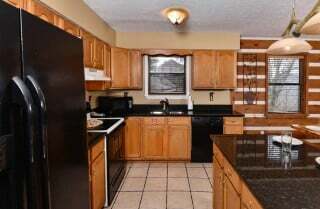 Also, as previously mentioned, this delightful home comes with high-speed internet to make posting funny vids to Facebook easy as pie! Don’t let the wonderful amenities and amazing views at Smoky View Top Shelf keep you from enjoying the exciting experiences in town! Pigeon Forge is loaded with adventure and surprise, so venture outside the cabin…at least once. 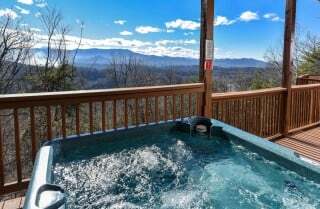 Spend a day riding rollercoasters, playing games, watching local craftsmen at work, shopping for souvenirs, and eating tons of southern goodies at Dollywood, an amusement park — mountain style. 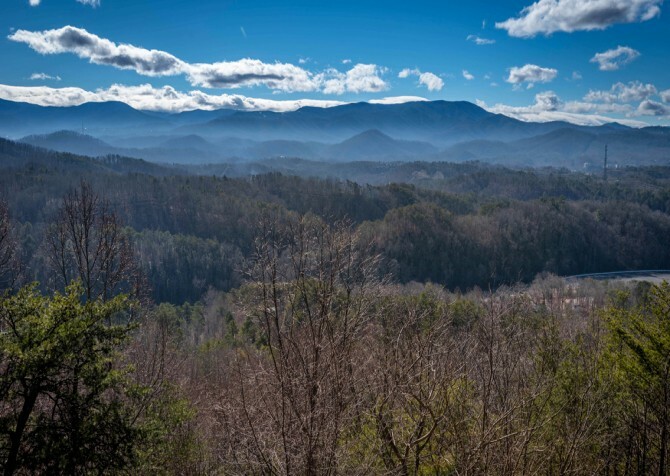 Soar through the trees at your own speed (up to 27mph) on the Smoky Mountain Alpine Coaster, a fun ride to share with a friend or to take on as a lone wolf. Show your family who’s boss at the Blake Jones Racing Center, a place of indoor go-kart madness…in the best way, of course.